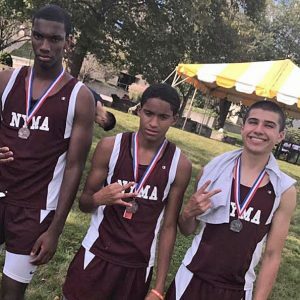 On 9/16, our NYMA Cross Country Team led by first-year coach Forrest Gordon opened the season on the road at Faith Christian Academy. The boys finished second overall out of four teams total. Individually, sophomore Matthew Montes came in 2nd place, sophomore Karif Isaacs came in 3rd place, and junior Josh Antoine finished 4th. Senior Zaahir Woody also finished in 16th place overall out of 30 runners. Eighth-graders Adam Sun and Daniel Geng both placed in the top-8 in the modified meet.